5 Bedroom Detached House For Sale in Larkhall for Offers Over £340,000. 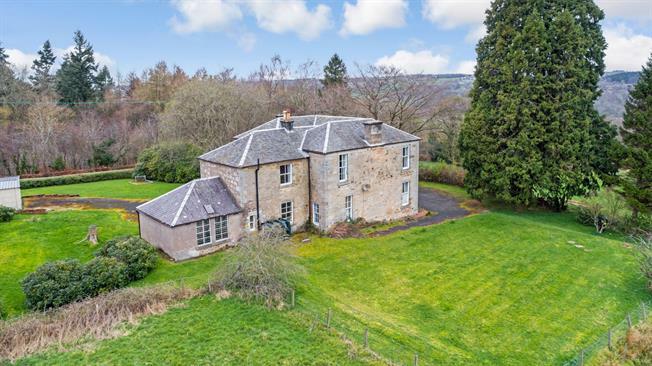 The Manse of Dalserf is a substantial detached house dating pre 1880, with an elevated position offering wonderful garden grounds and spectacular views over the River Clyde and beautiful Clyde Valley countryside. Expansive accommodation of some 3300sqft is arranged over two levels. The property does require a degree of upgrading with the current layout of character filled apartments comprising as follows: entrance porch, reception hall, lounge A, dining room, kitchen, bedroom 5 and WC. The remaining ground floor accommodation includes boiler room, workshop, stores and further WC. The upper level provides landing, lounge B, four further bedrooms, box room, bathroom and shower room. The sweeping driveway leads to a double detached garage with the gardens offering a high degree of privacy and being mainly laid to lawn. This much desired area is ideally positioned for a variety of amenities within the neighbouring towns of Larkhall and Wishaw including quality schooling, shopping and train stations.